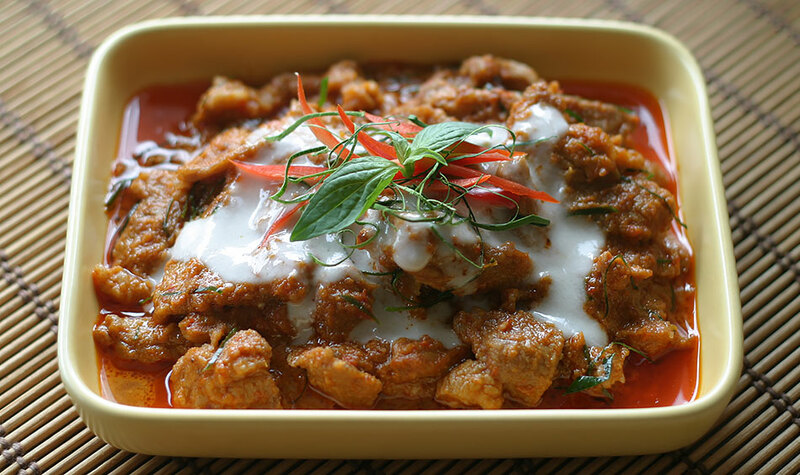 Turmeric Chicken (gai ka-min, gai leuang, ไก่ขมิ้น, ไก่เหลือง) is a common treat found in Pattaya or Bang Saen, the beach towns south of Bangkok. It’s grilled by vendors who push their carts next to the beach. You buy a few pieces, a batch of sticky rice, and enjoy your meal under an umbrella with your feet in the sand. Jett made this recipe for my family one summer in Cape Cod, and they ate the whole batch without stopping. Here’s her recipe. Peel the skin off the turmeric if using whole root. Smash with the garlic, coriander roots and peppercorns to make a paste. Rinse the chicken and add to a bowl. Add the soy sauce, fish sauce & sugar. Put your hand inside a plastic bag and rub the paste into the chicken. Poke the chicken with a fork a bit to make holes for the marinade to seep in. Coat well, cover and refrigerate for 4-5 hours or overnight. After marinating, either grill or bake in the oven until cooked. To test if your chicken is done, poke with a fork on the thickest part of the meat to the middle of the piece. Pull out the fork and watch the juice come out of the hole. If it’s pink, it’s not done. If it’s clear, it’s done. Don’t cut big slices into the piece or the meat will dry out. 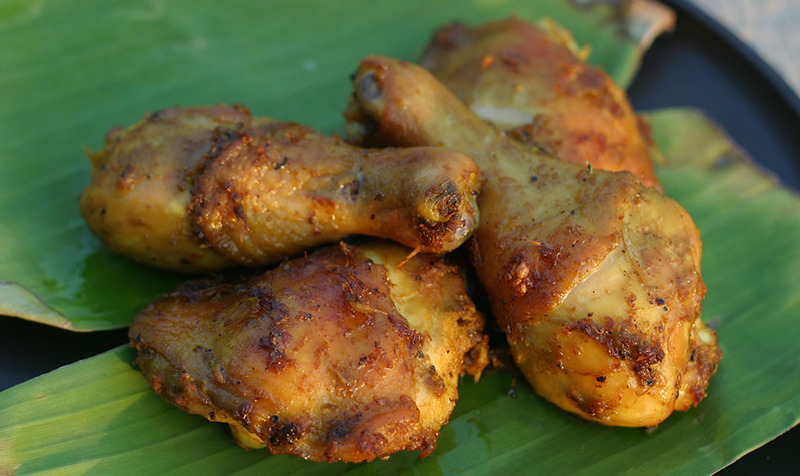 This is a great party/bbq food to share with friends. You can make a ton in advance and grill it outside. Jett made three 'family packs' of chicken (about 40 chicken legs + thighs) for some friends one night in the US. She was cooking on a grill. She turned around to taste it, and the chicken was gone. Her 3 friends had eaten it all and she didn't even get a chance to try it! Be careful with the turmeric -- it stains! It's almost impossible to get out of countertops, hands, plates, etc. thats my favourite fried chicken. …and i like the one in phuket too. I made this today after marinating for only 4 hours. It was superbly delicious and highly recommended! Extremely easy to prepare as well. Thank you! I grew up on this grilled chicken. 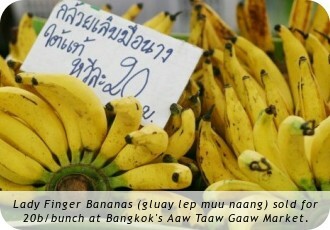 This with sticky rice and som tum. We made som tum with green beans or carrots since papaya could not always be found. Though we never had it with tumeric, but I had it like this for the first time when I went to Thailand. Now I always add the tumeric. We used the legs & thighs of one chicken (so two legs, two thighs) for this recipe. Thanks for noticing that I forgot to put that in the ingredients list! I will add that now. I want to try yhis recipe, but can I omit the fish sauce? what would be a subsitute? could I use the japanese vegitable and fruit bulldog sauce in it’s place? thanks. Is this the same as Satay Chicken? Hi, this looks so so delicious. Can I ask if all parts of coriander – roots, branch and leaves are to be used to make the paste? Is there another name that the local grocers calls coriander roots? Mishu – Just the roots are used in this recipe. You have to find cilantro/coriander which has the root still attached. Most grocers chop them off and don’t sell them here in the US, but might have them in the back of the store and they’ll just give them to you. If you can’t find them, you can substitute with the stems, but the flavor is different.